Stringent standards and certification requirements pertain to clothing worn in flash fire hazard zones. Patricia Gleason guides us through the fine details. Options for industrial flame resistant protective clothing have expanded significantly since the United States’ Occupational Safety and Health Administration (OSHA) issued a memo requiring employers to provide flame resistant clothing in oil and gas well drilling, servicing and production related operations. 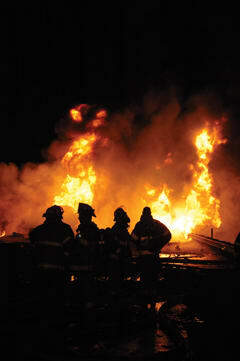 These types of industrial operations pose a potential threat of a flash fire, and appropriate protective clothing must be provided to keep employees safe. While these fires can be brief, their consequences to workers with insufficient protection can be dangerous and result in severe burns or fatalities. OSHA issued the ‘Enforcement Policy for Flame-Resistant Clothing in Oil and Gas Drilling, Well Servicing, and Production-Related Operations’ to clarify its policy for citing the OSHA general industry standard for personal protective equipment (PPE), 29 CFR 1910.132(a), for the failure to provide and use flame resistant protective clothing (FRPC) in oil and gas well drilling, servicing, and production related operations. OSHA’s inspection history coupled with scientific evidence, worksite accident and injury data, and the publication of industry consensus standards, indicated a potential for flash fires during certain well drilling, servicing, and production related operations. Drilling contractors, well servicing contractors, and oil and gas companies employ thousands of workers in these operations. In addition to inherent flash fire hazards, the industry has a history of burn related injuries and fatalities due to flash fires when engineering and administrative controls have failed. While it is noted that the oil and gas industry has put forth significant efforts to reduce the risk of flash fire incidents, their occurrence is still a possibility, and with that are the resulting burn injuries and fatalities. It has been documented that the use of FRPC greatly improves worker survival and chances for regaining quality of life after a flash fire. Wearing FRPC can reduce both the extent and severity of burn injuries to the body. OSHA has therefore concluded that employers are required to provide and ensure the use of FRPC during certain operations. A flash fire is defined as a fire that spreads by means of a flame front rapidly through a diffuse fuel, such as dust, gas, or the vapours of an ignitable liquid, without the production of damaging pressure. Ignition sources are present in several forms, including, but not limited to: electrical systems, handheld electrical tools, motors, generators, hot work activities and static electricity. Production related operations presenting potential for flash fires require the use of FRPC. These operations bring the well fluids to the surface, separate, store, gauge, and otherwise prepare the product for delivery. This phase occurs after a well has been drilled, completed, and placed into operation, or after it has been returned to operation following workover or servicing. Engineering and administrative controls serve to reduce, but do not eliminate, the potential for flash fires occurring during drilling, well servicing, and production related operations. Flammable liquids or gas could be released and migrate to ignition sources because of an inadequacy or failure in these engineering and administrative controls. Employers should ensure the use of FRPC in oil and gas drilling, well servicing, or production related operations when there is a potential for flash fire hazards. To address the need for FRPC the National Fire Protection Association (NFPA) in the United States established a Technical Committee, made up of industry experts who developed the first US FRPC performance standards to address industrial flash fire protection fabrics and components in garments. The first standards were approved by the NFPA membership in 2001. Several revisions have occurred since that time. These standards are now discussed in detail. The NFPA 2112, Standard on Flame-Resistant Garments for Protection of Industrial Personnel Against Flash Fire, 2012 Edition, provides minimum requirements for the design, construction, evaluation and certification of flame resistant garments which are used by industrial personnel with the intent of such garments to provide a degree of protection to the wearer, and not contribute to a burn injury, during a short duration thermal exposure or accidental exposure to a flash fire.The minimum requirements also for flame resistant garments are intended to reduce the severity of potential burn injuries. Users of the NFPA 2112 standard are advised to refer to NFPA 2113, Standard on Selection, Care, Use, and Maintenance of Flame Resistant Garments for Protection of Industrial Personnel against Flash Fire for conducting the appropriate hazard assessment to identify the in-use area’s minimum protection requirements. NFPA 2112 establishes certain design requirements for hardware finishes, metal components and slide fastener tape which are used in garments. For instance, any metal components or closure systems should not come in contact with the wearer’s body, hardware finishes should be free of rough spots, burs or sharp edges, and inherently flame resistant fibres should be used in the construction of slide fasteners. Labelling and user information requirements specify what information should be placed on the label, and what warnings, information and instructions should be provided with each garment. Additionally, as issues of proper fit are directly associated with the risk of injury, sizing charts indicating the range of key wearer measurements that are accommodated by each specific size of garment offered must be provided. NFPA 2112 performance requirements are extensive and include conditioning for certain tests. Conditioning of a material may include certain washing and drying procedures, or dry cleaning. The standard requires fabrics to pass numerous tests such as heat transfer performance according to ASTM F 2700 to measure unsteady state heat transfer properties, and the ASTM F1930, a thermal manikin test involving a jet fuel fire at a specified heat flux, or fire intensity, and exposure time of three seconds. NFPA 2112 sets the performance requirement for ASTM F1930 at a maximum of 50 percent body burn of the total surface area or less to be compliant. Also, each flame resistant garment fabric layer should undergo a flame resistance test in accordance with ASTM D 6413. There are additional requirements for thread, hardware, emblems and labels. The most recent edition of NFPA 2112 added definition and testing requirements for cold weather insulation materials to ensure that garments incorporating such insulation material are properly tested. This standard also includes critical Certification Requirements that are essential for manufacturers and certifying organisations to determine initial and ongoing compliance of FRPC for industrial personnel. Certification organisations audit the manufacturer’s quality assurance programme to ensure that the programme provides continued compliance for the certified product. If a manufacturer wishes to make a change to the product, the change must be presented to the certification organisation to determine what testing is required to ensure it does not affect the compliance of the product. In this certification chapter there are also requirements of the manufacturer’s quality assurance programmes, hazards involving a compliant product, the manufacturer’s investigation of complaints and returns, and safety alert and product recall procedures. Third party certification is an important means of ensuring the quality of products. To ensure consistency among certification organisations and the integrity of products used to provide workers appropriate protection, the NFPA standard requires the certification organisation to be accredited for personal protective equipment in accordance with ISO Guide 65, General requirements for bodies, operating product certification systems. Certification organisations must comply with at least ten ISO guides that cover all areas of certification, from laboratory management and inspection requirements to how a certification organisation protects its certification mark. Within these documents are a variety of requirements that third party certification bodies must meet in order to operate as a fully accredited service. Accreditation of a certification organisation provides a high level of confidence to manufacturers and the end users of the products. Additionally, the certification organisation’s testing laboratory should be accredited to ISO 17025, General requirements for the competence of testing and calibration laboratories. Accreditation is the evaluation of a laboratory conducted by a third party organisation that performs a technical assessment of the lab and its personnel in order to determine technical competence. The lab’s quality management system is also evaluated for compliance to the standard. To achieve accreditation, the lab must be found to be competent and compliant with the standard to which they are testing, as well as any additional requirements that are imposed by the third party. Per NFPA 2112, the certification organisation should conduct a follow up audit at the FRPC manufacturing facilities at least annually, and review manufacturing records to ensure garments continue to conform with the requirements of the standard, the manufacturer has documentation that the fabric and components used in the garment were tested by an ISO 17025 accredited laboratory and comply with NFPA 2112, and a manufacturing quality assurance plan is in place. FRPC suppliers are required to have an approved product recall procedure in place. FRPC that has been certified to the NFPA 2112 standard must be made publicly available per requirements in these standards as well as requirements in ISO Guide 65. NFPA 2113, Standard on Selection, Care, Use, and Maintenance of Flame-Resistant Garments for Protection of Industrial Personnel Against Flash Fire, 2012 Edition, provides minimum requirements for the selection, care, use, and maintenance of flame resistant garments compliant with NFPA 2112, for use in areas at risk from flash fires. The purpose of NFPA 2113 is to reduce the health and safety risks associated with the incorrect selection and use of FRPC, and those risks associated with incorrectly maintained, contaminated or damaged garments. The first requirement is for the employer organisation to institute a selection process for FRPC based upon a hazard assessment of the workplace, evaluate certified FRPC designs and characteristics to determine the type of garment that is necessary for the worker, and develop specifications for purchasing certified FRPC. For the selection of certified FRPC, the duration of the potential thermal exposure a person may be confronted with during escape is vital. This may be determined through a site and task hazard evaluation and analysis. The NFPA 2113 standard assists in this process. An example of one such item that is critical is that garments should be selected to offer minimal interference and minimal hindrance to perform the work task required in the flash fire hazard zone. To ensure a company’s facilities are compliant with NFPA 2113, a hazard assessment should be conducted in accordance with the 15 considerations listed in the standard. A hazard assessment should deliver a quantified energy level for the various tasks that workers perform. Use and care, including cleaning and decontamination and storage considerations for FRPC are provided in NFPA 2113. Some items include the instruction of workers in the limitations of garments, and the instituting of a policy not to allow workers to wear their regular clothing over their FRPC. Manufacturer’s instructions and warnings should always be used in all of these activities. Maintenance of FRPC should be part of an organisation’s workplace procedures for the protection of its employees. The organisation should develop an inspection programme for all FRPC to confirm their serviceability. Some organisations use outside service organisations to perform this function. Repairs should always be conducted in accordance with manufacturer’s instructions and garments cleaned prior to any repair. Maintenance records should be kept. Finally, retirement of FRPC should be conducted per the manufacturer’s stated service life, or when damaged and can no longer be repaired. FRPC should always be disposed of in a manner that ensures it will not be used for protection of personnel. As purchasing certified FRPC is a critical factor in the overall protection of employees in workplaces with potential for exposure to flash fire, garments independently certified to NFPA 2112 should always be sought. As the NFPA 2112 standard requires certification organisations to be accredited to ISO Guide 65, by default the certification organisation is required to publish a list of certified products. Companies seeking certified FRPC garments may visit the Safety Equipment Institute (SEI) website at www.SEInet.org.